Electrical engineering (sometimes called electrical and electronics engineering) is a professional engineering discipline that deals with the development of technologies for generating and harnessing electricity for a wide range of applications. The field first became an identifiable occupation in the late nineteenth century, with the commercialization of the electric telegraph and power supply. The field now covers a range of subdisciplines, including those that deal with power, control systems, electronics, signal processing, and telecommunications. This article treats electronics engineering as a subfield of electrical engineering, though some consider them as two separate fields. Electrical engineers may work on such things as the construction of electric power stations, the design of telecommunications systems, the wiring and lighting of buildings and transport vehicles, the design of household appliances, or the electrical control of industrial machinery. In this manner, electrical engineering plays a vital role in our modern technological society. … and complex electronic circuits. Electricity has been a subject of scientific interest since at least the seventeenth century, but it was not until the nineteenth century that research into the subject began to intensify. Notable developments of that period include the work of Georg Ohm, Michael Faraday, and James Clerk Maxwell. In 1827, Ohm quantified the relationship between the electric current and potential difference in a conductor. In 1831, Faraday discovered electromagnetic induction. In 1873, Maxwell published a unified theory of electricity and magnetism in his treatise on Electricity and Magnetism. 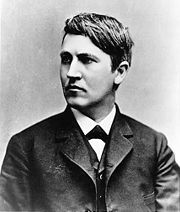 Thomas Edison built the world's first large-scale electrical supply network that provided direct current to customers. During these years, the study of electricity was largely considered a subfield of physics. It was not until the late nineteenth century that universities started to offer academic degrees in electrical engineering. The Darmstadt University of Technology founded the first chair and the first faculty of electrical engineering worldwide in 1882. In 1883, this institution and Cornell University introduced the world's first courses of study in electrical engineering, and in 1885, the University College London founded the first chair of electrical engineering in the United Kingdom. The University of Missouri subsequently established the first department of electrical engineering in the United States in 1886. 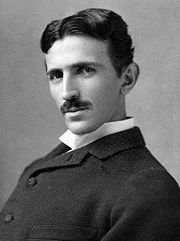 A photograph image of Nikola Tesla (1856-1943) at age 34. During this period, the work concerning electrical engineering increased dramatically. In 1882, Thomas Edison switched on the world's first large-scale electrical supply network that provided 110 volts direct current (DC) to 59 customers in lower Manhattan. In 1887, Nikola Tesla filed a number of patents related to a competing form of power distribution known as alternating current (AC). A bitter rivalry ensued between Tesla and Edison over their differing methods of power distribution; it was known as the "War of Currents." Eventually, AC became the preferred method for power generation and distribution, as it was recognized as being safer and more efficient, with a longer distribution range. Regardless of the rivalry, the efforts of both men did much to further electrical engineering—Tesla's work on induction motors and polyphase systems influenced the field for years to come, while Edison's work on telegraphy and his development of the stock ticker proved lucrative for his company, which ultimately merged with other companies to become General Electric. By the end of the nineteenth century, other key figures in the progress of electrical engineering began to emerge. During the development of radio, many scientists and inventors contributed to radio technology and electronics. In his classic UHF experiments of 1888, Heinrich Hertz transmitted (via a spark-gap transmitter) and detected radio waves using electrical equipment. In 1895, Tesla was able to detect signals from the transmissions of his New York City lab on Houston Street at West Point (a distance of 80.4 kilometers [km]). In 1920, Albert Hull developed the magnetron, which eventually led to the development of the microwave oven in 1946 by Percy Spencer. In 1934, the British military began to make strides toward radar (which also uses the magnetron), culminating in the operation of the first radar station at Bawdsey in August 1936. In 1941, Konrad Zuse presented the Z3, the world's first fully functional and programmable computer. In 1946, the ENIAC (Electronic Numerical Integrator and Computer) of John Presper Eckert and John Mauchly followed, beginning the computing era. The arithmetic performance of these machines allowed engineers to develop completely new technologies and achieve new objectives, including NASA's Apollo missions and Moon landings. Invention of the transistor in 1947 by William B. Shockley, John Bardeen, and Walter Brattain opened the door for more compact devices. It led to development of the integrated circuit in 1958 by Jack Kilby and (independently) in 1959 by Robert Noyce. In 1968, Marcian Hoff invented the first microprocessor at Intel and thus ignited development of the personal computer. The first realization of the microprocessor was the Intel 4004, a 4-bit processor developed in 1971. Yet it was only in 1973 that the Intel 8080 (an 8-bit processor) was available, making it possible to build the first personal computer, the Altair 8800. 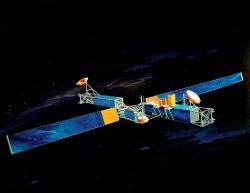 Radar is one of many projects an electrical engineer might work on. 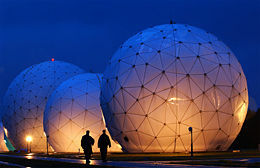 Here, radar antennas are housed in dome-like shells called radomes. Knowledge of physics and mathematics is fundamental to the discipline of electrical engineering, as they help provide qualitative and quantitative descriptions of how such systems will work. 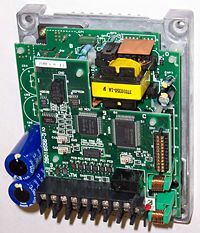 Today, most engineering work involves the use of computers, and it is commonplace to use computer-aided design programs when designing electrical systems. Most electrical engineers will be familiar with basic circuit theory—that is, the interactions of elements such as resistors, capacitors, diodes, transistors, and inductors in a circuit. In addition, engineers rely on theories that are more specific to the type of work they do. For example, quantum mechanics and solid state physics might be relevant to an engineer working in microelectronics, but they are largely irrelevant to engineers working with macroscopic electrical systems. Even circuit theory may not be relevant to a person designing telecommunications systems that use commercial, off-the-shelf components. Perhaps the most important technical skills for electrical engineers are reflected in university programs, which emphasize strong numerical skills, computer literacy, and the ability to understand the technical language and concepts related to electrical engineering. For most engineers, technical work accounts for only a fraction of their job. Much time is spent on tasks such as discussing proposals with clients, preparing budgets, and determining project schedules. Many senior engineers manage a team of technicians or other engineers, and for this reason project management skills are important. In addition, most engineering projects involve producing some form of documentation, requiring strong written communication skills. The workplaces of electrical engineers are just as varied as the types of work they do. They may be in a pristine lab environment in a fabrication plant, the offices of a consulting firm, or on-site at a mine. They may find themselves supervising a wide range of individuals, including scientists, electricians, computer programmers, and other engineers. Electrical engineering has many branches or subdisciplines, the most popular of which are listed below. Although some electrical engineers focus exclusively on one or other subdiscipline, many deal with several branches. Some fields, such as electronics engineering and computer engineering, are considered separate disciplines in their own right. Power engineering deals with the generation, transmission, and distribution of electricity. It includes the design of a range of devices, such as transformers, electric generators, electric motors, and power electronics. In many parts of the world, governments maintain electrical networks called power grids, which connect electric generators with users. By purchasing electrical energy from the grid, consumers can avoid the high cost of generating their own. Power engineers may work on the design and maintenance of the power grid as well as the power systems connected to it. Such on-grid power systems may supply the grid with additional power, draw power from the grid, or do both. 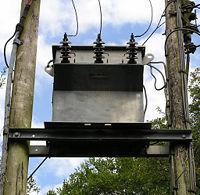 Power engineers may also work on off-grid power systems, which are not connected to the grid and may, in some cases, be preferable to on-grid systems. Control engineering focuses on the modeling of a diverse range of dynamic systems and the design of controllers that will cause these systems to behave as desired. To implement such controllers, electrical engineers may use electrical circuits, digital signal processors, and microcontrollers. Control engineering has a wide range of applications, from the flight and propulsion systems of spacecraft and airliners to the cruise control in modern automobiles. It also plays an important role in industrial automation. When designing control systems, control engineers often utilize feedback. For example, in an automobile with cruise control, the vehicle's speed is continuously monitored and fed back to the system, which adjusts the motor's speed accordingly. In cases of regular feedback, control theory can be used to determine how the system responds to such feedback. 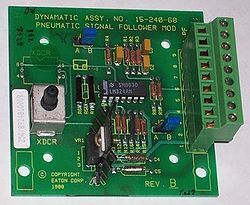 Electronics engineering involves the design and testing of electronic circuits that use the properties of components such as resistors, capacitors, inductors, diodes, and transistors to obtain particular functions. The tuned circuit, which allows the radio user to filter out all but a single station, is one example of such a circuit. Prior to World War II, the subject was commonly known as radio engineering and basically was restricted to radar and some aspects of communications, such as commercial radio and early television. In the post-war years, as consumer devices began to be developed, the field grew to include modern television, audio systems, computers, and microprocessors. In the mid to late 1950s, the term radio engineering gradually gave way to the name electronics engineering. Before invention of the integrated circuit in 1959, electronic circuits were constructed from discrete components that could be manipulated by people. These discrete circuits, still common in some applications, consumed much space and power and were limited in speed. By contrast, integrated circuits packed a large number—often millions—of tiny electrical components, mainly transistors, into a small chip around the size of a coin. This innovation allowed for the powerful computers and other electronic devices we have today. Microelectronics engineering deals with the design of extremely small (microscopic) electronic components for use in an integrated circuit, or occasionally for use on their own as general electronic components. The most common microelectronic components are semiconductor transistors, but all main electronic components (resistors, capacitors, inductors) can be made on the microscopic level. Most components are designed by determining processes for mixing silicon with other chemical elements to create the desired electromagnetic effect. For this reason, microelectronics involves a significant amount of quantum mechanics and chemistry. Signal processing deals with the analysis and manipulation of signals, which may be analog or digital. An analog signal varies continuously according to the information carried, and a digital signal varies according to a series of discrete values that represent the information. Signal processing of analog signals may involve the amplification and filtering of audio signals for audio equipment, or the modulation and demodulation of signals for telecommunications. In the case of digital signals, signal processing may involve the compression, error detection, and error correction of digitally sampled signals. Telecommunications engineering focuses on the transmission of information across a channel such as a coax cable, optical fiber, or free space. Transmissions across free space require information to be encoded in a carrier wave, to shift the information to a carrier frequency suitable for transmission; this is known as modulation. Popular analog modulation techniques include amplitude modulation (AM) and frequency modulation (FM). The choice of modulation affects the cost and performance of a system, and the engineer must carefully balance these two factors. Once a system's transmission characteristics are determined, telecommunications engineers design the transmitters and receivers needed for such systems. These two are sometimes combined to form a two-way communication device known as a transceiver. A key consideration in the design of transmitters is their power consumption, which is closely related to their signal strength. If a transmitter's signal strength is insufficient, the signal's information will be corrupted by noise. Instrumentation engineering deals with the design of devices to measure physical quantities, such as pressure, flow, and temperature. The design of such instrumentation requires a good understanding of physics, often extending beyond electromagnetic theory. 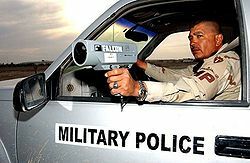 For example, radar guns use the Doppler effect to measure the speed of oncoming vehicles. Similarly, thermocouples use the Peltier-Seebeck effect to measure the temperature difference between two points. Often, the devices are not used by themselves but may act as sensors in larger electrical systems. For example, a thermocouple may be used to help ensure that the temperature of a furnace remains constant. From this perspective, instrumentation engineering is often viewed as the counterpart of control engineering. Computer engineering deals with the design of computers and computer systems. 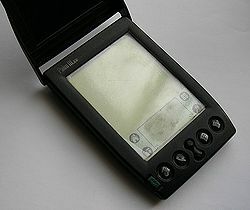 It may involve the design of new hardware, the design of personal digital assistants (PDAs), or the use of computers to control an industrial plant. Computer engineers may also work on a system's software, although the design of complex software systems is often the domain of software engineering, which is usually considered a separate discipline. Desktop computers represent a tiny fraction of the devices a computer engineer might work on, as computer-like architectures are now found in a range of devices, including video game consoles and DVD players. Mechatronics is an engineering discipline that deals with the convergence of electrical and mechanical systems. Such combined systems are known as electromechanical systems and are widely used. Examples include automated manufacturing systems; heating, ventilation, and air-conditioning systems (HVAC); and various subsystems of aircraft and automobiles. The term mechatronics is typically used to refer to macroscopic systems, but futurists have predicted the emergence of very small electromechanical devices. Already such small devices—known as microelectromechanical systems (MEMS)—are used in automobiles to tell airbags when to deploy, digital projectors to create sharper images, and inkjet printers to create nozzles for high-definition printing. Biomedical engineering is another related discipline. It is concerned with the design of medical equipment, including (a) fixed equipment, such as ventilators, MRI scanners, and electrocardiograph monitors, and (b) mobile equipment, such as cochlear implants, artificial pacemakers, and artificial hearts. Electrical engineers typically possess an academic degree with a major in electrical engineering. The degree, which may take four or five years to complete, may be designated Bachelor of Engineering, Bachelor of Science, Bachelor of Technology, or Bachelor of Applied Science, depending upon the university. The degree generally includes units covering physics, mathematics, project management, and specific topics in electrical engineering. Initially, such topics cover most (if not all) subdisciplines of electrical engineering. As they progress toward the end of the degree course, students choose to specialize in one or more subdisciplines. Some electrical engineers also choose to pursue a postgraduate degree, such as Master of Engineering, Master of Science, Doctor of Philosophy in Engineering, or an Engineer's degree. The Master's degree and Engineer's degree may consist of research or coursework or a mix of the two. The Doctor of Philosophy consists of a significant research component and is often viewed as an entry point into academia. In the United Kingdom and various other European countries, the Master of Engineering is often considered an undergraduate degree of slightly longer duration than the Bachelor of Engineering. In most countries, a Bachelor's degree in engineering represents the first step toward professional certification, and the degree program itself is certified by a professional body. After completing a certified degree program, the engineer must satisfy a range of requirements (including work experience) before being certified. Once certified, the engineer is given the title of Professional Engineer (in the United States, Canada, and South Africa), Chartered Engineer (in the United Kingdom, Ireland, India, and Zimbabwe), Chartered Professional Engineer (in Australia and New Zealand), or European Engineer (in much of the European Union). The advantages of certification vary, depending upon location. For example, in the United States and Canada only a licensed engineer may seal engineering work for public and private clients. This requirement is enforced by state and provincial legislation such as the Engineer's Act of Quebec. Practically all certifying bodies maintain a code of ethics which they expect all members to abide by or risk expulsion. In this way, these organizations play an important role in maintaining ethical standards for the profession. Even in jurisdictions where certification has little or no legal bearing on work, engineers are subject to contract law. In cases where an engineer's work fails, he or she may be subject to the tort of negligence and, in extreme cases, the charge of criminal negligence. An engineer's work must also comply with numerous other rules and regulations, such as building codes and legislation pertaining to environmental law. Professional bodies of note for electrical engineers include the Institute of Electrical and Electronics Engineers (IEEE). The IEEE claims to produce 30 percent of the world's literature in electrical engineering, has over 360,000 members worldwide, and holds over 300 conferences annually. Obsolescence of technical skills is a serious concern for electrical engineers. Membership and participation in technical societies, regular reviews of periodicals in the field, and a habit of continued learning are therefore essential ways of maintaining proficiency. ↑ The term electrical engineering may or may not encompass electronics engineering. Where a distinction is made, electrical engineering is considered to deal with the problems associated with large-scale electrical systems such as power transmission and motor control, whereas electronics engineering deals with the study of small-scale electronic systems including computers and integrated circuits. Another way of looking at the distinction is that electrical engineers are usually concerned with using electricity to transmit energy, while electronics engineers are concerned with using electricity to transmit information. ↑ "Ohm, Georg Simon," "Faraday, Michael," and "Maxwell, James Clerk," Encyclopædia Britannica, 11th edition (1911). ↑ Welcome to ECE! Cornell University - School of Electrical and Computer Engineering. Retrieved July 21, 2015. ↑ Karl Ferdinand Braun Nobelprize.org. Retrieved July 21, 2015. ↑ What Is Amateur Radio? History of Amateur Radio. Retrieved July 21, 2015. ↑ Bill Penley, Early Radar History Penley Radar Archives. Retrieved July 21, 2015. ↑ The ENIAC Museum Online. Retrieved July 21, 2015. 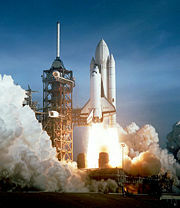 ↑ Electronics Timeline Greatest Engineering Achievements of the Twentieth Century. Retrieved July 21, 2015. ↑ Computing History (1971 - 1975). Retrieved July 21, 2015. ↑ James Trevelyan, What Do Engineers Really Do? - slides, University of Western Australia, 2005. Retrieved July 21, 2015. ↑ Quebec Statutes and Regulations (CanLII) Engineers Act. Retrieved July 21, 2015. ↑ About the IEEE, IEEE. Retrieved July 21, 2015. History of the IEEE Electrical Engineering Professional Society. All About Circuits Learn the nuts and bolts about building electrical circuits, and to build appliances based on electrical circuits. This page was last modified on 18 September 2017, at 21:45.